A webcam can be used for many things other than chatting, like video surveillance or to help physically disabled people, as long as we have the appropriate software. 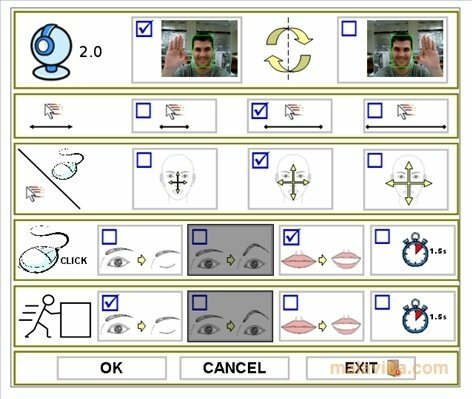 HeadMouse is a program that will help someone to control the mouse thanks to the movements of their head and eyes, in such a way that it is possible to click, drag and drop elements, and use a virtual keyboard to write. Once the application is installed, we will have to configure the camera (light, color, focus,... ), as well as customising the controls with movements, like blinking, lifting our shoulder, moving our mouth,... to change between different applications or click. An aspect to take into account is that it's necessary to use the program in a room with plenty of light, natural if possible, because if not the application may not work properly. Download HeadMouse and start controlling your computer with your head movements thanks to your webcam.